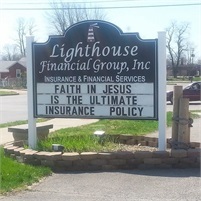 About | Lighthouse Financial Group, Inc.
For many, understanding every aspect of insurance can be daunting. From insurance to investments to retirement, the decisions can be overwhelming. That’s where Lighthouse Financial Group, Inc. comes in. Appointments are always free. You will have a personal agent assigned to you to sit down and evaluate your needs, answer your questions, and offer advice. We take pride in being able to help you navigate the insurance maze. We are a broker of many different companies, so we will shop whatever plan best fits your needs and budget and find you the best price with the best rated insurance companies like Mutual of Omaha, Anthem, Gerber, and many more! We work hard to create a mutually beneficial and respected long-term relationship with our clients and their families. For more information about our agency and our services, please call or stop by. We would love the opportunity to serve you.